A slab of silicon with missing cores? 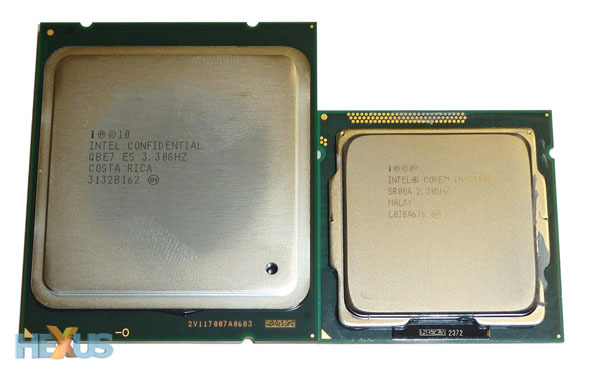 The LGA2011 name indicates the chip is going to be physically large - there are 2011 pads on the back, for starters. Just how large is shown by the picture comparing an engineering-sample Core i7 3960X against an LGA1155 Core i5 2500T retail chip. Underneath the heatspreader, the 'six-core' die size is reckoned to be 434mm² compared to an LGA1366's 239mm² and a standard Sandy Bridge's 216mm². Yup, there's no two ways about it, the latest Core i7 is a big, big chip. It's not immediately apparent where the extra die space has been allocated, but one look at the Intel-provided picture, below, betrays a few secrets. See, even this six-core, 12-thread monster isn't SNB-E in its fullest form. Notice the two unlabelled cores on both the bottom left- and right-hand sides? A fully-fledged LGA2011 chip will have these active, though pragmatic thinking of TDP and cooling, especially in a desktop environment, means we won't see the absolute potential of this chip for a while - indications are that it may arrive in Xeon form first. 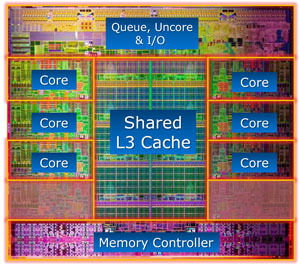 Per-core L1 and L2 cache remains the same. However, L3 is boosted from 12MB to 15MB (and can be 20MB on eight-core chip), and in many ways this counteracts the benefits of quad-channel memory-controller. Whatever the design implications, more cache is almost certainly always better. Though Intel hasn't spilled any further details on the matter, it would be reasonable to assume that 32nm Sandy Bridge has a myriad of cache tweaks aimed at streamlining throughput. Rolling in with Sandy Bridge are AVX extensions, making these new chips more efficient at processing floating-point-intensive instructions used in applications such as image- and video-editing software, which rely heavily on SIMD optimisations. But we'd challenge you to find more than a handful of AVX-optimised apps for the consumer market, making this more of a specification tick than real-world benefit right now. And further underscoring the Sandy Bridge heritage is Intel's decision to run with DMI 2.0 as the chip-to-system interconnect, supplanting the QPI found on Core i7 990X. DMI 2.0 has a peak transfer rate of 20Gb/s through a x4 link. A brief examination of the new Core i7 3960X's architecture suggests it should be a little faster than 990X when evaluated over a wide range of benchmarks. The main instigators of this performance increase are: greater memory bandwidth, AVX extensions, better Turbo Boost implementation and general behind-the-scenes tweaks that inevitably occur when moving from one microarchitecture to another. The Core i7 3960X should pull a slight lead over 990X in a straight CPU-to-CPU fight - more so if the application is tailored for Sandy Bridge's improved ISA. One has to remember that the new chip isn't entirely different Westmere/Gulftown 990X in a number of ways, and it will take Intel transitioning to the as-yet-unannounced eight-core, 16-thread design before genuinely big-dollop performance improvements are seen across every application. Who has a thousand bucks? Intel, though, is introducing more than one Sandy Bridge Extreme chip at this juncture. The better bet, financially speaking, is the $564 (£450) Core i7 3930K. Look back at the first table and it's apparent that this second-rung chip is no poor cousin. Running at almost the same frequency and unlocked so that you can push it as high as you like, it'll just lose a touch of performance by having 20 per cent less L3 cache - 12MB vs. 15MB. Core i7 3930K makes far more implicit sense than Core i7 3960X, too, because it's logical to assume that initial runs of both chips are harvested from the same wafers, intimating comparable overclocking potential. Why not get a Core i7 3930X and jack it all the way up to, say, 4,700MHz (47 x 100MHz BCLK) and beat the pants off a stock-clocked Core i7 3960X? But perhaps the most interesting of the trio is the four-core, eight-threaded Core i7 3820. Its pricing is below the just-launched Core i7 2700K, but limited overclocking control - usually the benefit of having a K-series chip - lack of integrated video outputs and expensive motherboard support count against it. Word on the street is that we won't see this chip at retail until early next year, which is a shame. Anyway, three new performance chips, two released today, cement Intel's position as the provider of the fastest consumer CPUs for high-performance desktop systems. There's nothing radically new here, as Intel simply moves its Extreme line over to an architecture that's been available for almost a year now. But new or not, you can't run a chip without a board, so let's take a closer look at the X79 chipset.